I'm back! See, I wasn't lying this time! I'm going to be an avid blogger, I've promised myself. One of the things Andrew and I were most excited about when it came to moving in together was our kitchen. It was something we seriously considered in all of the apartments we looked at - we wanted something big enough for both of us to be in together with enough counter space and ample cupboard space. Cupboard space was important - being in our own place we wanted to ensure everything had a space to call home, not only in the kitchen, but throughout the entire apartment. Our kitchen is the perfect size for the two of us. It's not so small that when you turn around you hit the other counter, but it's not so big that you could put a bed in it, either. I've always liked to be in the kitchen cooking or baking, and I knew that with our own place we would have the ability to spend as much time in there without worrying if roommates would be waiting to use the appliances or get in the way. We've been here a month and it's safe to say that we've only caved and ordered pizza once! We make a solid effort to grocery shop for a weeks worth of meals and cook every night. It's one of my favourite ways to end the day, whether one of us is at the counter while the other sits at the table and reflects on their work day, or whether it's a team effort and we're both chopping and chatting away! a simple take on lo mein. it turned out more like stir fry but it was loosely based off of this Rachael Ray recipe. 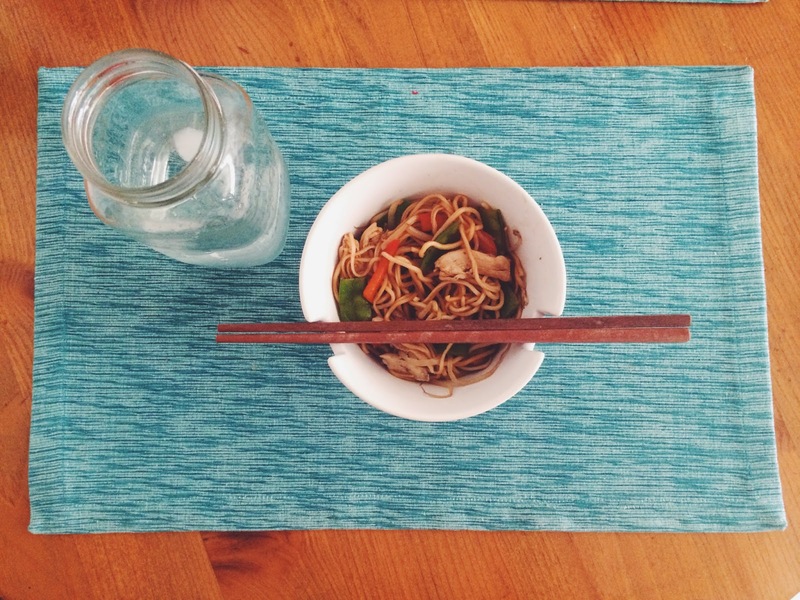 we're big fans of our Distinctly Home noodle bowls we received as a housewarming gift! 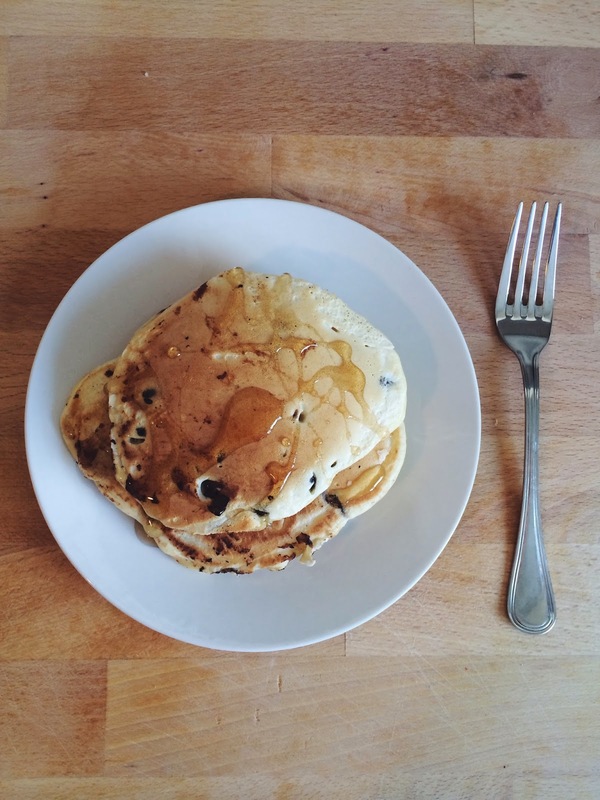 chocolate chip pancakes - my mom's recipe! I made these for breakfast on victoria day because we had friends visiting and really, who doesn't love a heaping stack of chocolate chip pancakes after a wild weekend! 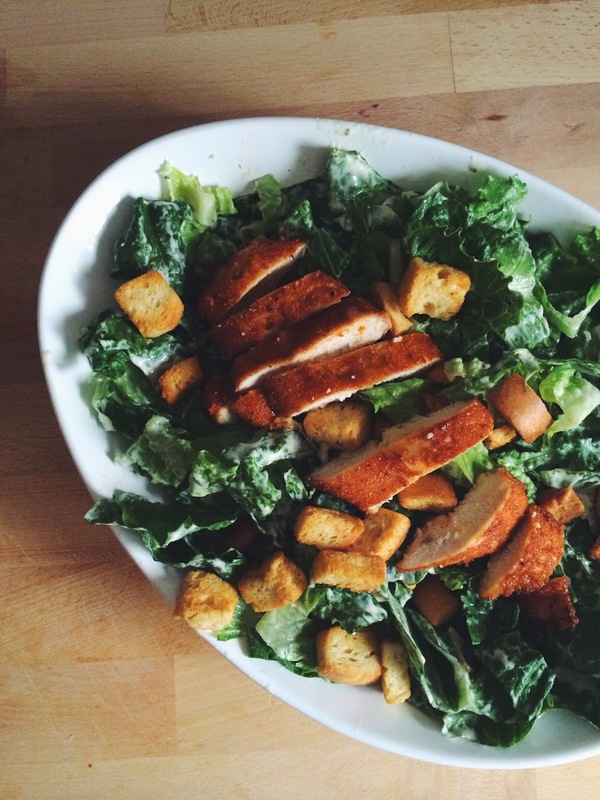 chicken caesar salad, a simple and easy meal. Andrew bakes the chicken in the oven after shaking it in one of these "Open Season" spice blends he picked up. despite the fact it's from an outdoor sporting goods store, it's pretty good! on top of a bed of fresh romaine and some crunchy croutons, this makes for the perfect weeknight meal. we really like curry. 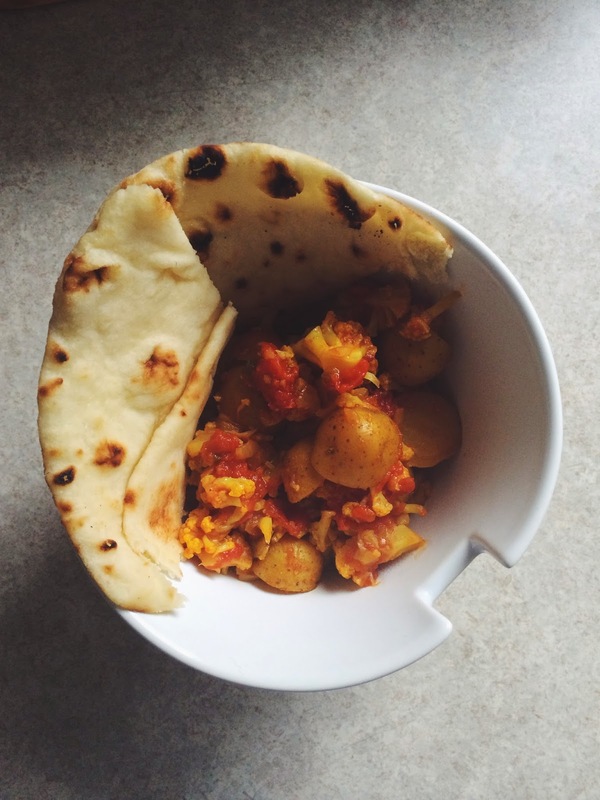 chickpea is usually our choice, but with cauliflower being the latest food trend and we had a bag of baby potatoes begging to be used up, a quick google search brought me to this cauliflower and potato curry. my go-to chickpea curry recipe is from the BBC as well and I'll be the first to say that they know what they're talking about! we had it with warm naan, but it would be even better on a bed of basmati rice! We've had a really busy last few weeks, and it's not slowing down any time soon, but we've still managed to make an effort to cook even if it is sometimes frozen fish and french fries! It goes without saying we're super excited to see what else lies ahead for us! this makes me so happy. I love it.